This option is essentially the Goddess Retreat plus 2 Days on the Beach in Essaouira beforehand. 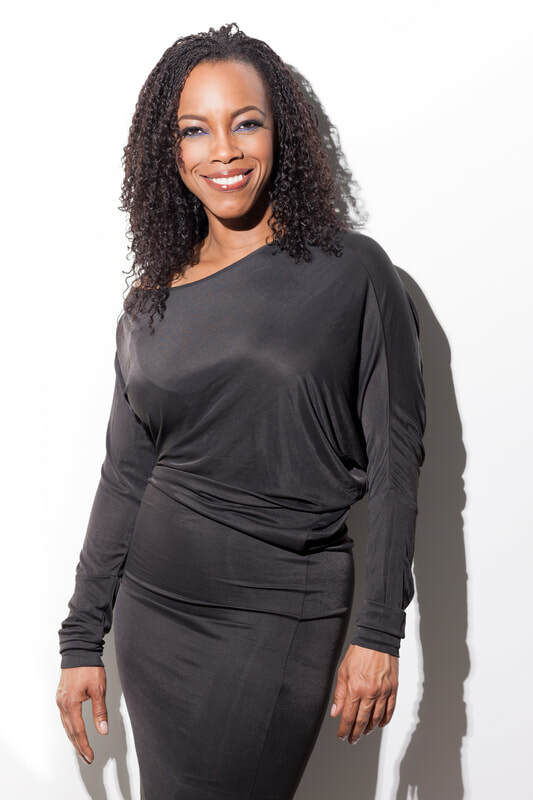 The DreamingMoroccoRetreat is the brainchild of actor, writer, coach & Tony-winning producer, April Yvette Thompson. That would be me. 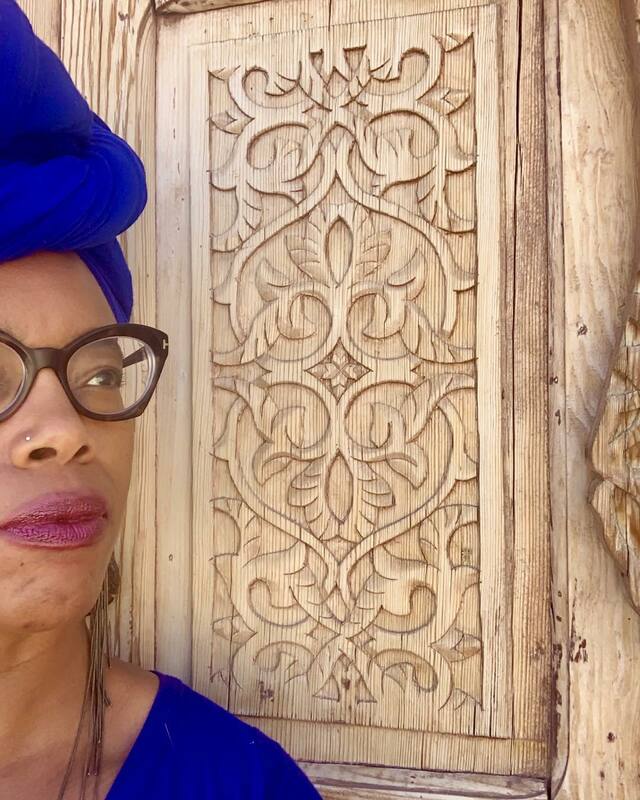 I've always loved the aesthetics of North Africa, the art, food, textiles have always felt familiar to my soul, so when I had the chance to visit, my nomad spirit was embraced and I felt at home. 9 months later, I moved to Marrakech. As a coach, I have tons of clients who come to me to get unstuck in their careers, to take the bull by the horns and stop working for others and work exclusively for themselves doing what they dream of doing. In my visit to Morocco, I met many women at Cooperatives who were first time entrepreneur who had tons of questions about how I created a online business that sustains me and gives me the freedom to dream and travel. 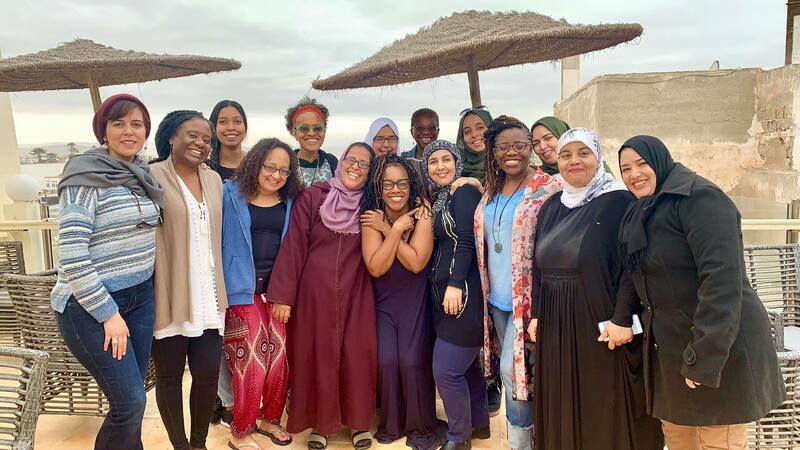 So, it occurred to me, why not bring the retreats I do in NYC to Morocco and better yet, to host Moroccan women who run their own cooperatives and make their participation my giving back to the country that so warmly embraced me. That's where the DreamingMorocco Retreat began in 2018. 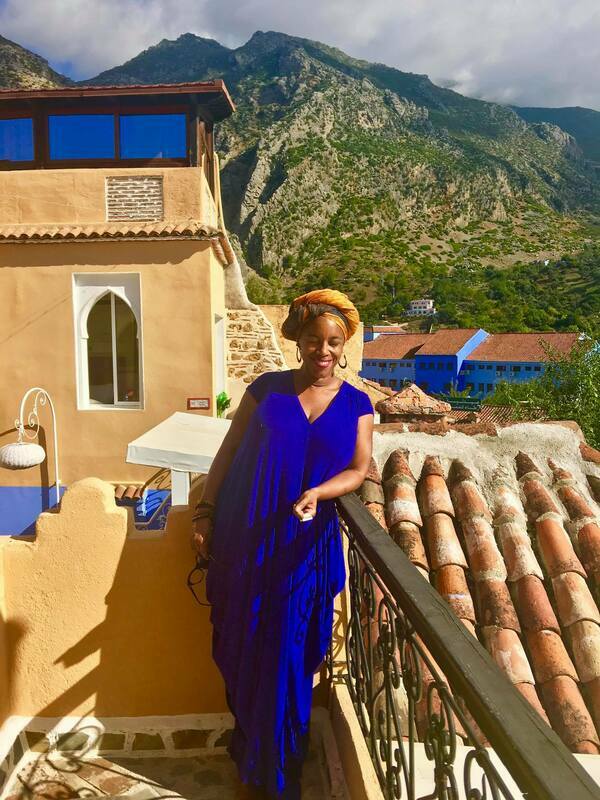 It was a gorgeous success and over the next few weeks, once you sign up, i'll be sending you photos and stories of the women who joined the retreat last year. So, I'm doing it again with my business partner, Rachid Ait El Haj of Experience Morocco. 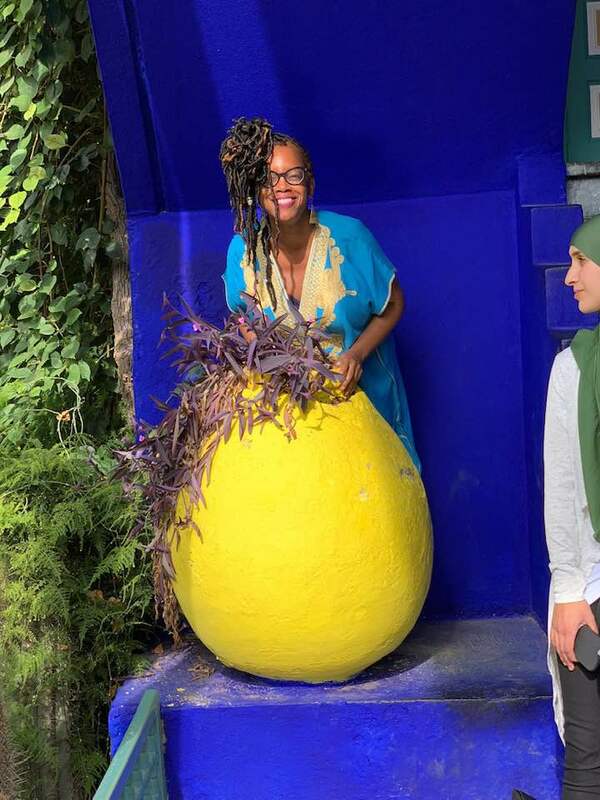 The 2019 DreamingMorocco Cultural Immersion Tour & Godess Retreat has 3 different incarnations: 17 Day, 9 Day & the 6 Day. ATTENTION: Please review this itinerary carefully. This is a day by day schedule of what you'll be doing each day of the retreat. 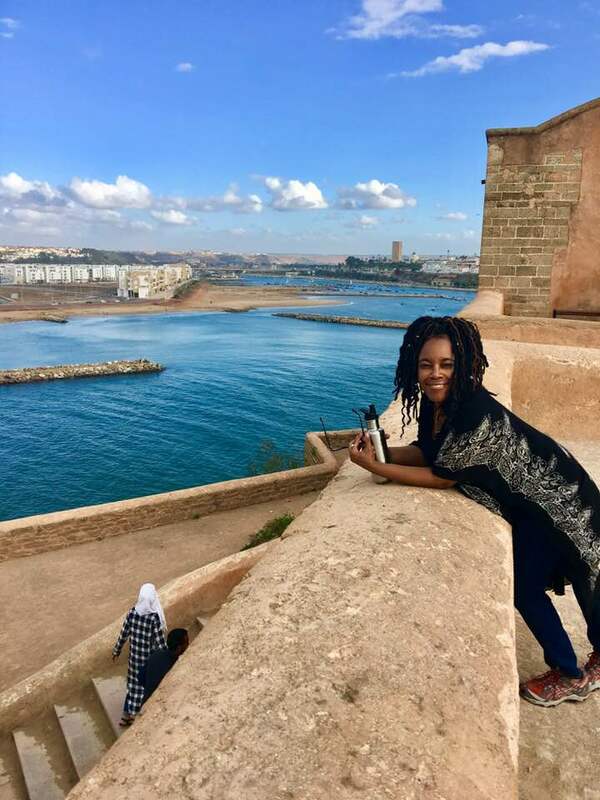 OPTION 1: If you want to see the entire country, from mountains to the sea, start at Day 1 of the 17 Day DreamingMorocco Cultural Immersion Tour & Goddess Retreat and read through the amazing daily itinerary. OPTION 2: If you're interested in the 9 Day Beach & Goddess Retreat, scroll down to Day 10 of this itinerary. 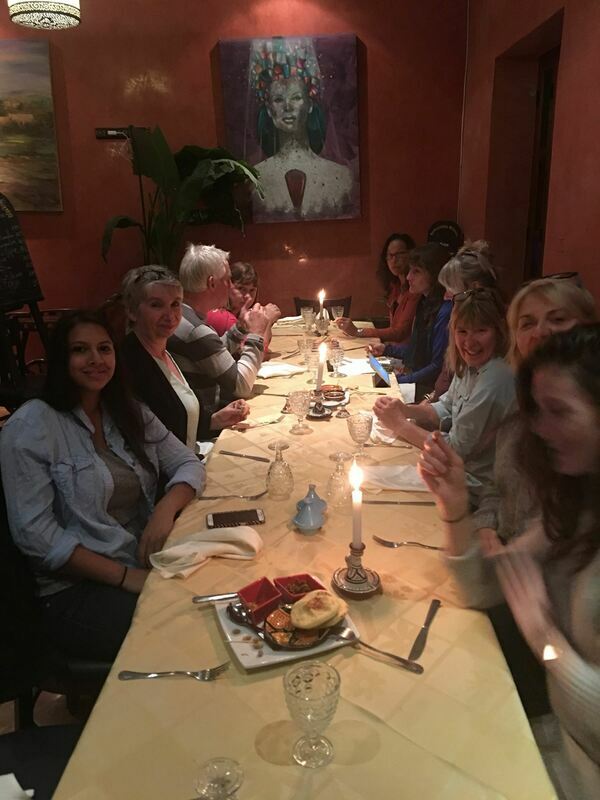 OPTION 3: If you're interested in the DreamingOutLoud Goddess Retreat in Marrakech, scroll down and start at Day 12. Your adventure begins today with a welcome meeting at 6pm. If you can't arrange a flight that will arrive in time, you may wish to arrive a day early. We'll be happy to book additional accommodation for you. 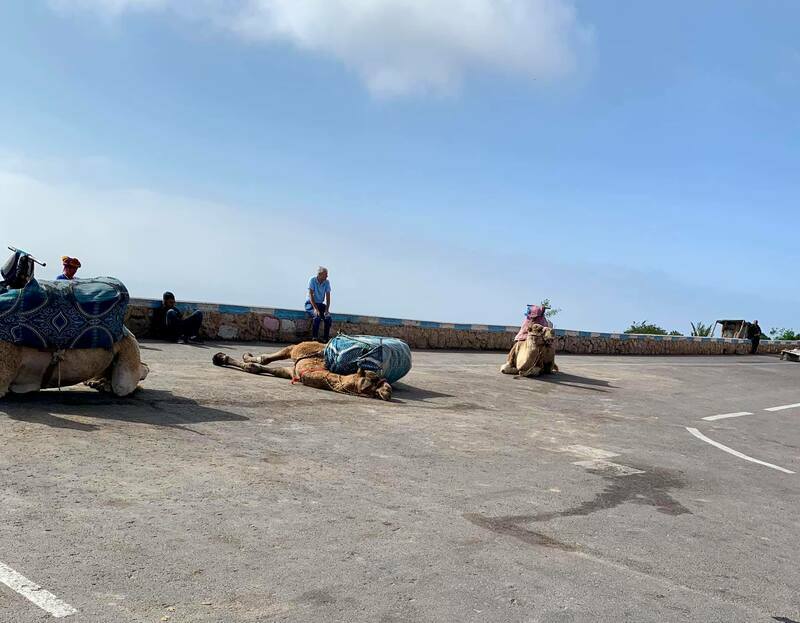 We’ll pick you up from your hotel in the morning, leaving Casablanca’s colonial buildings behind and beginning the journey along the Atlantic Coast and up into the Rif Mountains and the charming whitewashed village of Chefchaouen. 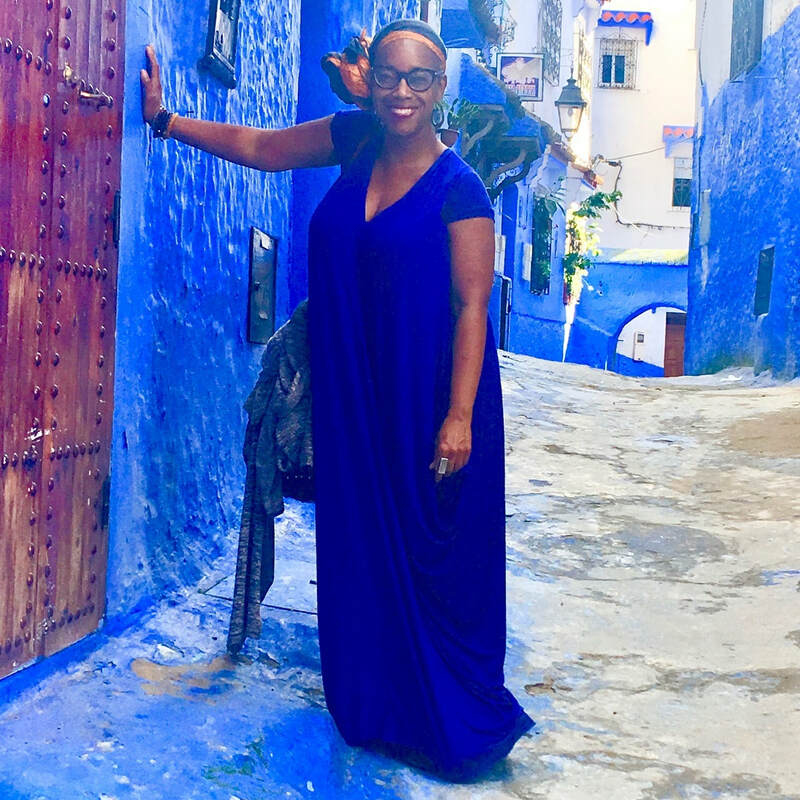 One of the prettiest destinations in Morocco, this artsy village with its small but delightfully blue-doored, red-roofed medina is a mix of Moroccan and Andalusian influences. 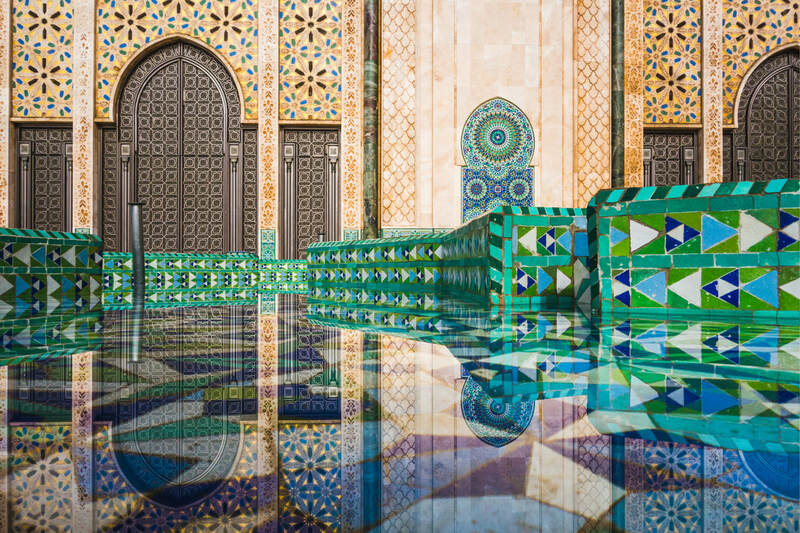 Along the way you’ll stop off in Rabat for a guided tour of the old medina, the whitewashed Kasbah des Oudaias, Bab Oudaia and Hassan Tower—the remnants of what was once planned to be the second largest mosque in the world. In Chefchaouen you’ll spend the night in a hotel. This morning you’ll start travelling towards the mediaeval city of Fes, first making a stop at the UNESCO World Heritage Site of Volubilis. Here you’ll go on a guided tour of one of the most well-preserved Roman ruin sites in North Africa. 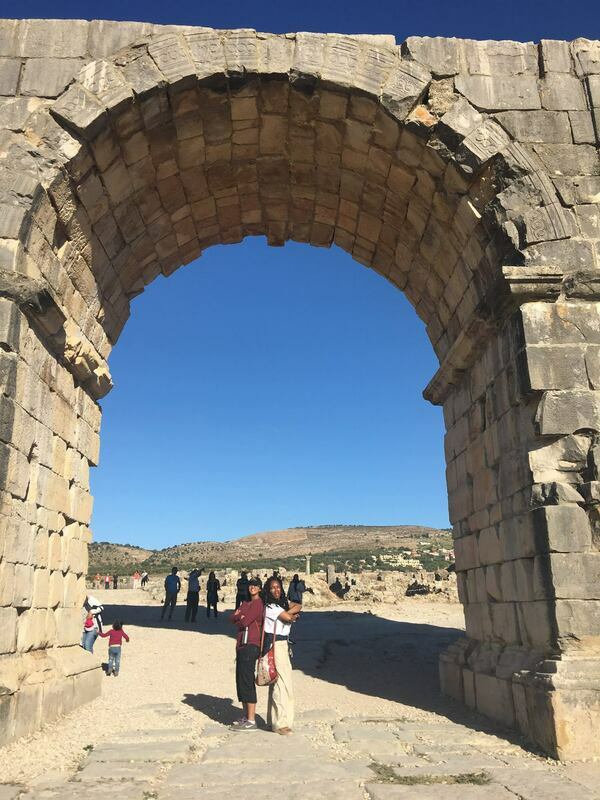 After visiting Volubilis you’ll continue on through the verdant countryside of northern Morocco to Fes where you’ll spend the next two nights in a riad. Today you’ll head into Fes’ old city—known locally as Fes el Bali—on a guided tour of one of the most extensive and well preserved historic towns of the Arab-Muslim world. You’ll visit the souks, the tanneries and their famous dye pits, Medresse el Attarine and the beautifully restored 18th century inn, Funduk Nejjarine. You’ll even stop by a ceramics factory where you can see potters and their students working in the traditional way. And as you walk along the narrow streets and alleyways that make up this UNESCO World Heritage Site, you’ll pass the historic khans, mosques, craftsmen and donkeys laden with goods that make this journey back to the Middle Ages one truly unforgettable experience. Today you’ll begin your journey to the vast expanse of sand that is the Sahara, leaving Fes behind in the morning and journeying south through the Middle Atlas and on to Merzouga. Along the way you’ll pass through some spectacularly varied scenery—fertile valleys, cedar and pine forests, barren, rocky landscapes and the spectacular Jurassic geography of the Ziz Gorges, including Tafilalt—the largest Saharan oasis in Morocco. You might even catch a glimpse of a Barbary ape—North Africa’s only monkey. When you reach the desert outpost of Merzouga on the edge of Erg Chebbi you’ll meet your camel and begin an unforgettable 1.5-hour ride to a nomadic camp in the middle of the dunes. Upon arrival at the camp you’ll be served a traditional Berber meal and treated to some local tribal singing and drumming by the campfire. Here you’ll spend the night in a luxury tent. After waking early to watch the glorious sunrise over the still eastern dunes you’ll hop on your camel once more and ride out of the Sahara. And after saying goodbye to your camel in Merzouga you’ll begin your journey to Boumalne Dades, a great place to go for a walk in the countryside and discover the local Berber way of life. Along the way you’ll stop in the small town of Tinejdad and visit the Oasis Museum. This group of three restored houses displays Berber antiquities and objects of traditional use collected from various tribes across the country. You’ll also visit Todra Gorge—a narrow, 300m-high canyon and one of the most dramatic natural sights in Morocco—and take a short walk through the nearby palm grove. In Boumalne Dades you’ll spend the night in a kasbah. This morning you’ll go on a guided walk through Dades Gorge before leaving Boumalne Dades and travelling along the fabled 'Road of 1000 Kasbahs, before passing through Ouarzazate —the “Hollywood of Morocco”—and continuing on to Ait Ben Haddou. This fortified city is so famous for its 17th century ksar that it’s been listed as a UNESCO World Heritage Site since 1987; it’s even served as a filming location for Hollywood movies such as The Gladiator and Jewel of the Nile, and more recently the tv series Game of Thrones. In Ait Ben Haddou you’ll have a walking tour of the main passages of the ksar and spend the night at Kasbah. Today you’ll journey to the magnificent Toubkal National Park via the spectacular Tizi n’Tichka (2,260m)—one of the highest drivable passes in Morocco. Along the way you’ll follow the winding roads that lead you from the south’s vast desert plains to the High Atlas’ gorgeous green valleys, passing many a beautiful landscape and Berber village along the way. When you arrive in Imlil (1,800m) you’ll begin your 1-hour walk up to the peaceful Berber village of Aremd (1,920m). Here you’ll spend the night in a Berber guesthouse. This morning you’ll walk back down to Imlil, before continuing on to the Atlantic Coast and Essaouira—Morocco’s “Windy City”. This charming seaside town with its fortified walls, fishing harbour, lively markets, long sandy beaches and seagulls is the perfect place to both relax and be active. Along the way you’ll have the opportunity to stop at an argan oil co-operative, where you’ll be shown the process of extracting and preparing the oil. In Essaouira you’ll spend the next two nights in a riad. This morning you’ll have a guided tour of Essaouira’s medina, visiting its remparts, fishing port and fish market and souks. Relax at the hammam with a black soap soak, invigorating scrub and relaxing organ oil massage. 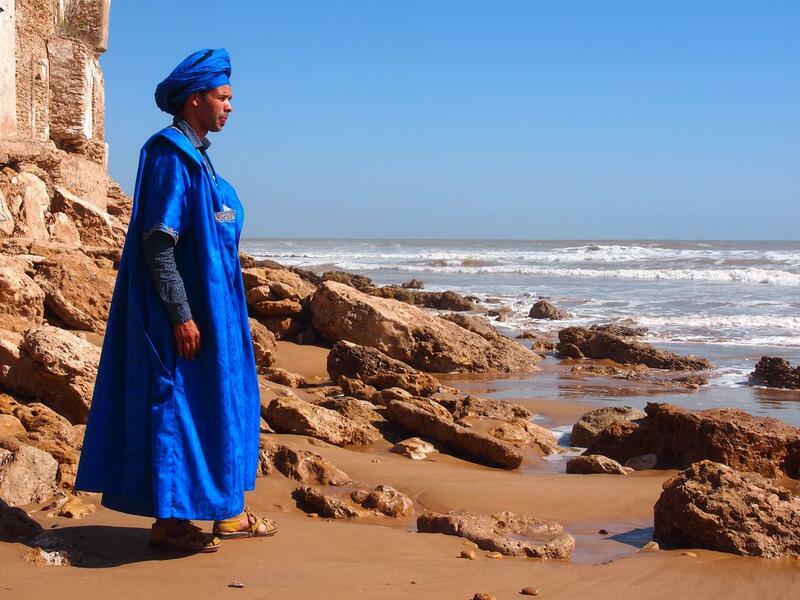 Explore Essaouira’s stunning coastline by horseback, riding on the beach, in the dunes and in the forest. Ride the waves at this windsurfer’s paradise. But try taking a lesson if you’re new to the sport—reliable strong winds can be challenging. After breakfast, you''ll be free to roam the souk of Essaouira or go the beach...it's your time...then lunch will be your own. We'll meet back at the riad in the afternoon and travel to Marrakech in our tour van. Today you’ll journey to the red city of Marrakech. Begin your experience with an early morning transfer from your Marrakech accommodation to your balloon’s launching site. Upon arrival hop in the basket and gaze away as this sunrise flight takes you soaring over the foothills of Morocco’s Atlas Mountains. Touch down for a freshly prepared Berber breakfast before returning to Marrakech in your 4×4 vehicle. At the end of the day take home a flight certificate as a souvenir of your experience. Visit this enchanting garden in the heart of the city, designed by French painter Jacques Majorelle (1886 –1962). Stroll along the shady paths past exotic trees and plants, streams and pools whilst watching the numerous birds that call this peaceful paradise home. Get ready for the ultimate tagine experience during this one of a kind activity in Marrakech. Begin by learning the Arabic for the key ingredients of Morocco’s most famous dish as you join your teacher in the souks. Here you’ll mix with the locals when shopping for your meat, vegetables and most importantly, spices. Head back to the traditional riad kitchen and learn how to brew a pot of refreshing Moroccan mint tea, before following your teacher’s step-by-step instructions to prepare your very own mouthwatering lunch. At the end of the day take home a copy of the recipe as an everlasting memory of your authentic Moroccan cooking experience. We’ll pick you up from your hotel and transfer you to the airport. On this tour you’ll explore some of Morocco’s most amazing destinations, visiting its four imperial cities, its mountains and its geographical center. Over 15 incredible days you’ll wander the winding paths of Chefchaouen’s whitewashed medina, visit the craftsmen, markets, tanneries and mosques of Fes, ride a camel into the endless dunes of the Sahara Desert, discover the 17th century ksar of Ait Ben Haddou, cast your eyes upon North Africa’s highest peak—Jebel Toubkal, relax in the charming seaside town of Essaouira, and be enchanted by the magicians, storytellers and musicians of Marrakech’s Djemaa el Fna. Along the way you’ll see the stunning colonial architecture and palm-lined boulevards of Rabat, go back in time to the Roman Empire at the archaeological site of Volubilis, be amazed by the impressive ramparts and monumental gates of Meknes and journey through the diverse landscapes of the Rif, Middle Atlas and High Atlas Mountains. This journey through Morocco truly is the adventure of a lifetime! The first $500 is a non refundable deposit which secures your spot. Any cancellations later than 1 month from the first payment and your deposit can be credited for a future trip exactly one year from the date of initial purchase. All payments are non-refundable after the first two months of the payment cycle. ​If an automatic payment is skipped for insufficient funds, you will be charged $50 late fee and the entire balance of the trip will be due immediately. ​· As Morocco has a tipping culture, travellers are expected to tip small amounts for most services, so please be prepared. Your leader will suggest methods and amounts to tip during the trip. 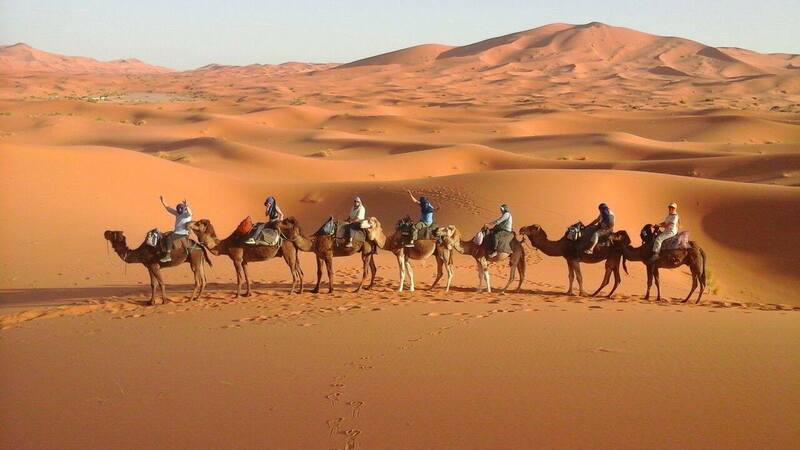 · A camel trek through the Sahara Desert is a highlight of the trip for many. If you're uncomfortable with this, it's possible to walk alongside the camels for about an hour to the camp. You would need to walk back the same distance the next morning, but don’t worry - it’s a gentle, relaxing walk. The opposite can be said for the hike up to Aroumd, as you'll be trekking up steep, rocky steps for around an hour. If you do decide to do this walk then you'll need comfortable walking shoes, but you can also hire a mule to ride up all the way. Please also note that your main luggage will be left behind, as only hand luggage can be carried up to the village for you. · The weather in Morocco can be extreme. Summer temperatures can be uncomfortably hot, especially for those who aren't accustomed to the heat, so please consider what time of year you travel carefully. If you do travel in the warmer months then pack layers to cover you from the sun, bring the necessary sun protection and drink plenty of water. The desert can also get cold at night, so remember to bring base layers and warm clothing. · We have sourced our accommodation very carefully and picked the best possible hotels, but please note that service and accommodation in Morocco may be different to western standards. On the second day of the trip, the journey by bus to chefchaouen is windy in places so it's not for the feint hearted. Although the backdrop of the stunning Rif Mountains makes this a truly scenic journey. Physical rating A good level of fitness is recommended and will certainly help increase the enjoyment of the trip and help you to make the most of the variety of optional walks and hikes around towns and villages. Please reconfirm your departure transfers with your trip leader (Rachid). If you are flying out of Casablanca: Trains from Marrakech to Casablanca, depart every 2 hours between 4:45am and 12:45pm The trip is scheduled to take 3 hours & 30 minutes and is subject to frequent delays. From Casablanca Voyageurs Station, trains run to the Casablanca airport every two hours at 13 mins past the hour between 03h13 and 22h13. From Casa L’oasis (first station in Casablanca), trains run to the airport every hour between 05h40 and 21h20. The trip takes 45 minutes. Alternatively, from Casablanca city the 25km taxi ride to the Casablanca airport. Please note a private transfer from your Marrakech hotel to Casablanca airport is available for sale 150$. A selection of optional activities are listed in the day 16. All activities are subject to availability and need to be mentioned to Rachid during the first week of the trip, he will provide more information and cost. it may not be possible to do all the activities listed in one day. You may find the same activity cheaper with another operator on the ground, however we cannot vouch for the safety or quality of that operator. Australians, New Zealanders, Canadians, Americans, EU and British citizens do not require a visa to visit Morocco for stays up to 90 days. All other nationalities should check with the Moroccan Embassy or Consulate in their country for up-to-date visa information. Moroccan food is, generally speaking, excellent and particularly varied. Breakfasts usually consist of bread, butter, cheese and jam with coffee, tea & orange juice. In main towns it is possible to find very good French and Moroccan restaurants where a meal and French wine will cost anything from Mad 25$- 35$. Generally dinner is likely to cost between MAD 10$-15$ depending on what you order. There are vegetarian options given the new hotels we're staying in. Vegetarians will have choices of vegetarian couscous, tajine, pasta, salad, pizza or omelettes. Fish will be available in towns that are close to the sea: Agadir, Rabat, Essaouira, Marrakech. Generally Morocco is very known for it is fresh vegetables. 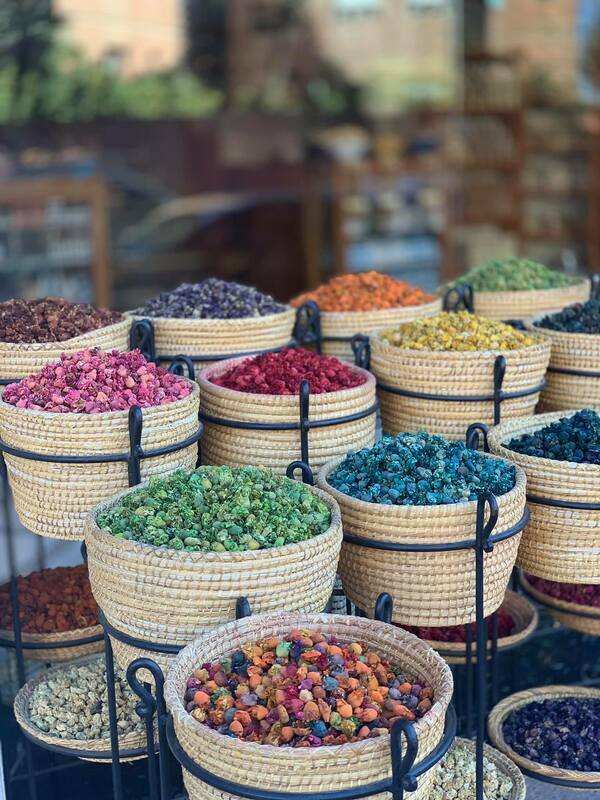 If you need vegetarian food seasoned to your taste, you can supplement that with what you bring from home or pick up spices from Morocco's amazing spice markets starting in Fez. Vegans and those on gluten-free diets may find this region very challenging and may need to supplement meals with their own supplies from supermarkets and markets. There are some long travel days and some rough travelling in areas away from main tourist routes. High passes, windy roads and rough surfaces make for some challenging travel experiences. On some long travel days we depart early in the morning to ensure we optimise our time at our next destination. If you experience travel sickness we recommend you consider medication to help ease the discomfort. The best part about all of these long drives are the spectacular views and fun stops en route such as mountain passes, kasbahs, palmeries, sand dunes, goats up trees etc. The currency of Morocco is the dirham (MAD). Bank notes come in denominations of MAD 200, 100, 50 and 20. Smaller values are issued as coins in values of 10, 5, 2 and 1 as well as 50c, 20c, 10c and 5c. Changing money is easy and you will find banks and exchange bureaux in Casablanca, Fes and Marrakech. If you're happy with the services provided a tip - it's of great significance to the people who will take care of you during your travels, inspires excellent service, and is an entrenched feature of the tourism industry across many destinations. Restaurants we suggest 8% to 10% of your bill. Local guides: Throughout your trip you may at times have a local guide in addition to your leader. We suggest $2- per person per day for local guides. Drivers: We would suggest a higher tip for those more involved with the group however $3 per person per day is generally appropriate. You may also consider tipping your tour leader for outstanding service throughout your trip. The amount is entirely a personal preference, however as a guideline $4-$5 per person, per day. Of course you are free to tip more or less as you see fit, depending on your perception of service quality, remember a tip is not compulsory and should only be given when you receive excellent service. · Clear plastic sandwich bag for any hand luggage liquids. · Photocopy of your passport. · Please always have comfortable shoes for the trip as it will involve different walking distances. · If you use a hiking pole, it would be a good idea to bring it with you. · Make sure your necessary items are in your hand luggage i.e. travel documents, medications, electronic devices etc. · Keep a sarong/pashmina in your hand luggage – it can be used as a blanket on the plane, a scarf if it’s cold or a shawl on an evening out. · Bring a small, soft/fabric bag to put your essential items in for the two nights in the sahara camp where you won’t have your main luggage with you, I advise you to keep the suitcase in bus away from the dust and sand. · Roll your clothes instead of folding them. · Stuff socks and underwear inside of shoes. · Take photos of your luggage and its contents in case it gets lost. · Skip airport snacks and pack your own – you can save yourself a bit of time/money and keep your hunger at bay if your flight’s delayed. · If you’re driving to the airport, take a photo of your car and where it’s parked. For the latest weather information, go here before your departure and choose clothes accordingly. SCAMS: When walking through touristy areas of cities you may be approached by 'helpful' locals who want to show you where to go or take you to a local spice shop. They will either ask to be your local guide for the day or expect money when you arrive at your destination. Please note these people are not registered guides and will try and get as much money from you as they can. A friendly 'no thank you (or 'la Shukran') should suffice. While travelling there is always the risk of pick-pocketing and petty theft, particularly in the more touristy cities. We recommend that you exercise caution when walking alone at night and encourage you to walk together and only on main, well-lit thoroughfares. Simple measures like carrying your day pack on your front, not hanging your bag over the back of your chair or on the floor and wearing a money belt will reduce any chance that your valuables should go missing. You must purchase travel insurance that covers you for the entirety of your trip before your trip start date.